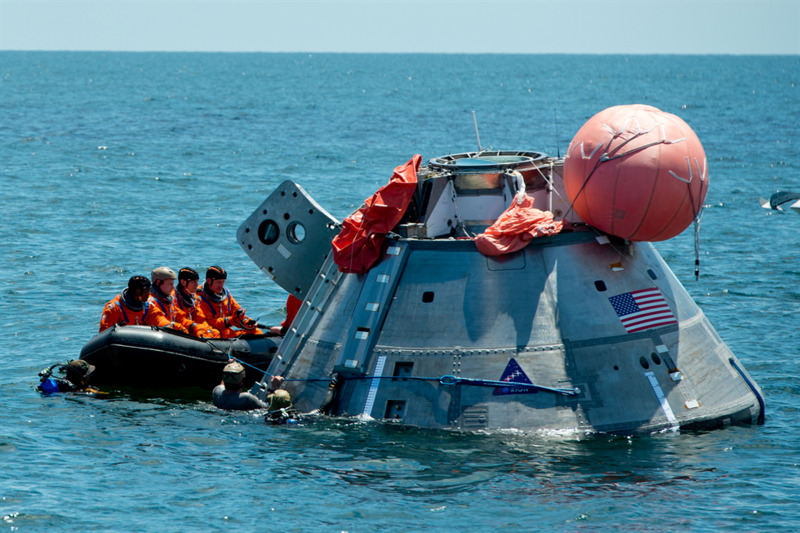 When astronauts return to Earth from destinations beyond the moon in NASA’s Orion spacecraft and splash down in the Pacific Ocean, they’ll still need to safely get out of the spacecraft and back on dry land. Using the waters off the coast of Galveston, Texas, a NASA and Department of Defense team tested Orion exit procedures in a variety of scenarios from July 10 to 14. Orion is designed to sustain a crew that has splashed down in the ocean for up to 24 hours. When the capsule and its crew return from deep space missions, during one recovery method, small boats of Navy personnel will arrive soon after landing. They will assist the crew as they exit through the side hatch of the capsule, onto rafts, and take them and the capsule back to an awaiting Naval ship. Crew members must also be prepared to get out of the spacecraft if conditions aren’t as favorable. If the capsule were to land off course and recovery teams were not expected to arrive quickly, or water intrudes into the crew module before they arrive, astronauts must be prepared to get out of the spacecraft alone. The testing builds upon the development and execution of recovery procedures practiced in the Neutral Buoyancy Laboratory at NASA’s Johnson Space Center in Houston, a 6.2-million-gallon pool that is used for astronaut training and provided a calm environment for initial testing. Engineers expect to conduct additional future crew egress testing in open water.